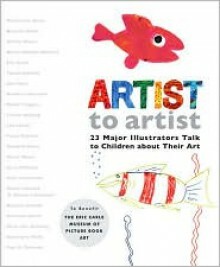 In this remarkable and beautiful anthology featuring the likes of Maurice Sendak, Robert Sabuda, Rosemary Wells, and Eric Carle, twenty-three of the most honored and beloved artists in children’s literature talk informally to children—sharing secrets about their art and how they began their adventures into illustration. Fold-out pages featuring photographs of their early work, their studios and materials, as well as sketches and finished art create an exuberant feast for the eye that will attract both children and adults. Self-portraits of each illustrator crown this important anthology that celebrates the artists and the art of the picture book. An event book for the ages. Proceeds from the book will benefit the Eric Carle Museum of Picture Book Art in Amherst, MA.